Despite continued controversy surrounding the Joint Conference of Chief Ministers and Chief Justices of High Courts, Prime Minister Narendra Modi addressed the gathering at the inaugural ceremony with all vigor. He said that the Judiciary, which is powerful, needs to become perfect so that it matches up to the expectations of the people of the country. While addressing the gathering, PM Modi began by taking note of the fact that the idea of this forum is to increase transparency and strengthen each other, and in turn strengthen India. He spoke about the growing concern over corruption and pendency of litigation and hoped that the conclave of Judges would recommend fresh approaches to deal with these issues. He called for an integrated approach. He said, “We all are same kind of individuals carrying out different responsibilities as per our potential and capabilities. But this is not the case with people in judicial system. What they do is divine, and god has sent them to carry out this divine responsibility." "We (the political class) are lucky that people watch us, assess us and rip us apart. You (Judiciary) are not as lucky… If you order a person to death, he also comes out and says that he believes in the judiciary...When there is little scope for criticism, the need of the hour is to develop an internal mechanism for self-assessment where the government and the politicians have no role," the Prime Minister said. The remarks seem have come as an aftermath of the recent impeachment proceeding initiated against Justice S.K. Gangele of Madhya Pradesh High Court for alleged sexual harassment of a woman judicial officer. Rajya Sabha Bulletin said, “The Chairman has, under section 3 of the Judges (Inquiry) Act, 1968, admitted the following Motion received from Shrimati Wansuk Syiem and other Members (total fifty-eight) the notice of which was given under Article 217 read with Article 124 (4) of the Constitution of India.” You may read more news about the issue here. He further favored a comprehensive review of the system of government-appointed Tribunals to assess their efficacy and effectiveness. 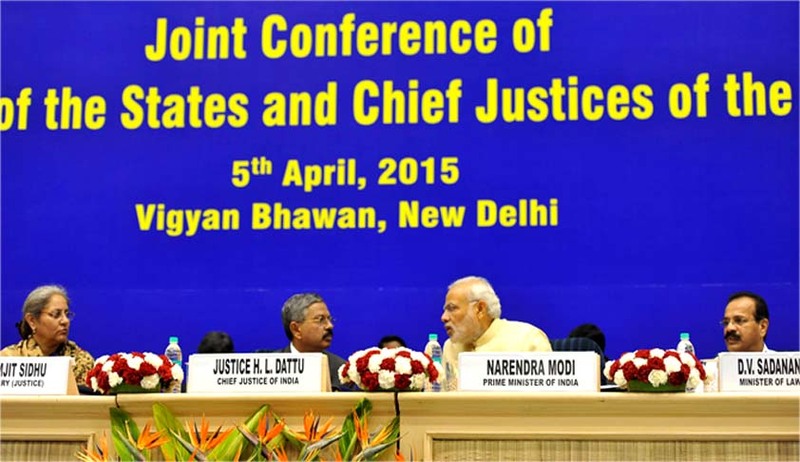 His inaugural address spoke about his interaction with CJI Dattu degrading quality of manpower into the judiciary. He acknowledged the fact that the quicker we get technology in this field, the easier it will be to bring about qualitative change. Advising judiciary to avoid "perception-driven" verdicts, Prime Minister Narendra Modi today said it should have an internal mechanism of "self-assessment". He made the gathering aware of his seriousness towards improving infrastructure for the Judiciary, for which an amount of Rs 9749 crore had been earmarked for strengthening the Judiciary under the 14th Finance Commission. He hoped that states would not divert the funds meant for improving judicial infrastructure given under the 14th Finance Commission. The PM also stressed on the need for established more educational institutions dealing with law and legal services. He also emphasized on the increased necessity of Lok Adalats and Family Courts, in the light of increased family disputes. The PM spoke about the need to do away with unnecessary laws in the country. The Government too on many occasions declared its intention of repealing obsolete laws and with Law Commission also suggesting repealing of laws, the Lok Sabha today passed the Repealing and Amending (Second) Bill, 2014 in December last year. You may read more news about the issue here. Earlier, Justice Kurian Joseph, a sitting Judge of the Supreme Court of India has expressed his concern about the All India Judges Conference. He wrote a letter to Chief justice of India and all Chief Justices saying that holding a judges’ conference on a national holiday like Good Friday could result in marring the nation’s secular fabric. He was of the opinion that a constitutional authority such as the Supreme Court must respect the concept of why the national holiday was declared in the first place. Read the LiveLaw story here. There were reports that Justice Vikramajit Sen had also objected to the conference. CJI Dattu however refuted any such claims. You may read the entire text of PM Modi’s speech here.